Pro LTTE media this evening (Mar 6) announced that Tamil National Alliance (TNA) parliamentarian Kiddinan Sivanesan was killed in a bomb blast that said to have occurred in the Kanagarayankulama area. According to the media reports, the bomb explosion had occurred around 2.p.m. targeting the MP's vehicle that had been travelling on the Jaffna- Kandy (A-9) main road. The MP was on his way to Kilinochchi, the reports further said. Meanwhile, pro LTTE media made their usual claim that the Army Deep Penetration Unit (DPU) is responsible for the bomb blast. Defence.lk when referred the matter to a senior defence official, was told that no military operation is presently being conducted in the area. "If the reports given by LTTE propaganda elements are correct, the location of the bomb blast is at least 25Km in the LTTE dominated area from our last (security forces') bastion at Omanthai. How can we expect anyone, even a well trained commando group to enjoy a cake walk that far on the heavily guarded A-9 road", he asked. Inquired as to why the LTTE is making such claims, he said that it has been the practice of the terrorists to fabricate such false stories either to cover their own crimes or to avoid the blame whenever something went wrong for them. Mr. Sivanesan, age 51 years, was a Jaffna district parliamentarian who entered into the House as a TNA national list member in 2004. 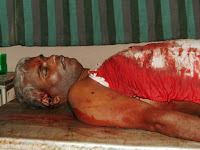 He was also a resident in Kilinochchi. LTTE has killed large number of democratic Tamil politician, whoever tried to go against its ideologies based on tribalism and those who held moderate views on the national problem. President Mahinda Rajapaksa was awaiting an important visitor on Monday, February 25. It was none other than UN Assistant Secretary General Angela Kane, and the last thing the President wanted was any major human rights violations, while she was around.However, orders were not given to stall all cordon-and-search operations within the city or, even if it was, it didn’t trickle down to all the police stations. On Monday (25), a police team from Mutwal, swooped down on a super luxury lodge in Wolfendhal Street and arrested a Muttusamy Ilankoowan alias ‘Samy’.Ilango or, Ilanko, as he is also known, was the second-in-command of the LTTE international shipping network. In fact, Ilanko, a Singaporean national, had, reportedly, arrived in Sri Lanka, with the intention of filing a case against the Sri Lankan government, to claim compensation for the destruction of one of his ships. Inquiries revealed that Ilanko owned the MV “Irish Mona”, which was plundered by the LTTE on August 29, 2007, while on a voyage to Jaffna, transporting 136 civilians. Two Dvora fast attack craft of the Sri Lanka Navy were destroyed during the confrontation. It is in question whether the government in power at the time, had ever known that the ship belonged to an LTTE agent. Ilanko is now suspected by sleuths, of claiming compensation for the unserviceable ship, after setting up the background to destroy two Dvora craft. Sleuths believe that Ilanko fled to Sri Lanka, when the Singaporean authorities were after him for training LTTE divers in Singapore. They believe that he returned to Sri Lanka under the pretext of claiming compensation for the ship. The government version is that some of his ships, carrying weapons, were destroyed by the security forces, during the war. Ilanko is learnt to have hired passenger ships to successive Sri Lankan governments, to ferry people to the north and even slain UNP MP T. Maheswaran had a few such ships hired to this administration.Not knowing that a prize catch was in custody, a senior police officer was trying to get Ilanko released, and have the police officer who arrested him, transferred. A top Military Intelligence officer had to then intervene and explain to the senior police officer that Ilanko was wanted in connection with a number of LTTE activities and was fairly influential within the terrorist organization. Ilanko was handed over to the Criminal Investigations Department (CID), according to a senior defence official, who tried to get information about the arrested suspect, but was politely told that any information in the media could hamper investigations, as other LTTE operatives would go into hiding. This is absurd, as the information, already on several government websites, would suffice to alert LTTE operatives.Sleuths feel that the arrest of Ilanko could lead to further arrests and vital information of the LTTE’s international operations. But, one government website, www.news.lk, posted a story that gave an unusual twist to it. Ilanko, according to this story, was believed to have confessed that he was responsible for abducting businessmen and extorting funds for the terrorist outfit, besides running arms shipments and drug smuggling. The twist looks absurd, as the Defence ministry website had castigated a TV station for misleading the people with a report it aired, saying, Ilanko was abducted by men who came in a white van, when he was actually arrested. It seems a bit absurd that a Singaporean national of his stature within the LTTE, would arrive in the country to mastermind a spate of abductions of Tamil businessmen. The same www.news.lk, story, in the same breath, says, he was a pilot Singapore Air Force for some time. The website went to absurd lengths to state that Ilanko had confessed that he met the leader of the LTTE suicide bombers training group in Singapore and was convinced that he should help the LTTE. If he, as claimed, was coming to claim compensation from the government, for the destruction of one of his vessels, would he admit that he was a committed LTTEer?He had, of course, told police that he had traveled to Jaffna, Vavunia and Batticaloa, before being arrested in Colombo. While the Defence ministry website, www.defence.lk, went the extra mile to prove pictorially that Ilanko was highly connected to the top brass of the LTTE, with whom he has posed for photographs, the organisation has decided to remain mum on the arrest. Even the usually pro-active pro-LTTE Tamilnet had thought it fit not to report the news item or, even give it the usual twist.However, the official TELO website reported on these lines: “The abducted Singapore national is Mr. N. Ilanko.The Defence website has pictures of Ilanko with LTTE Leader Velupillai Prabhakaran, slain Political Wing Leader S.P. Thamilselvan, LTTE Sea Tiger chief self styled Col. Soosai and a host of others. Fifty-seven-year-old Ilanko joined the LTTE a year after the riots, it is claimed, and received Sea Tiger training in Kilinochchi and further training in South India. However, he fled to Singapore, when he was being tracked down by the Indian authorities. Ilanko, who received Singaporean citizenship, was appointed head of the LTTE naval division, after Captain David was taken into custody in Tamil Nadu in 1994, in connection with the Rajiv Gandhi assassination. Interestingly, another LTTE activist, G. Ilanko, a British passport holder, was arrested in Chennai, back in January 2007, in connection with a massive credit card racket, where he had in his possession 28 ATM cards. He had illegally withdrawn over Indian Rs 3 million from ATMs and sent it to the UK. The Ilanko, who was arrested on Monday, was a billionaire, who owned three ships, even before he was appointed as second-in-command of the LTTE’s International Shipping Network under Kumaran Padmanathan alias KP, who himself was arrested in September last year in Thailand. KP was later released owing to pressure from corrupt Thai military officers, who have been in the LTTE payroll for a while. Whenever senior LTTE officers are arrested, they are soon released on huge bribes running into millions of Bahts.Another of KP’s deputies, Thavarajah, however, was arrested in Indonesia.Ten years after the Rajiv Gandhi assassination, India’s Central Bureau of Investigation (CBI), in May 2001, spread its dragnet to Malaysia, to track down KP, the absconding kingpin in the assassination case, and his associates. The investigating agency approached its counterpart in Malaysia, seeking cooperation in the investigations by recording statements, seizing statements of bank accounts of the suspects and other documents. It also wanted KP nabbed, if he was still hiding anywhere in Malaysia. For this, an official communication was sent to the Malaysian Government, but KP remains a fugitive. KP had, in the 80s, set up a shipping company in Kuala Lumpur, in the name of Vikram Holdings Private Limited, to transport material to the LTTE, through ships from Malaysia, Singapore, Hong Kong, Cyprus, Thailand, USA and France.Much of KP’s work fell on Thavarajah, his deputy, who also briefly went underground, following a major US, FBI breakthrough that netted 13 suspected Tigers in a sting operation in August 2006. The following month, more arrests- mainly of foreigners- were made in connection with exporting arms to the LTTE. Again Thavarajah’s name did not surface. As all was quiet and his name did not come up, he dropped his guard. On January 4, 2007, he undertook an important trip to Malaysia, to resume his all-important duties. The LTTE badly needed arms, ammunition and accessories for a critical phase in a decisive Eelam War.Thavarajah who had traveled extensively to Indonesia, Malaysia, the US, Laos, Burma, Thailand, Afghanistan and Vietnam, had 12 passports of different countries on his person, at the time of his arrest in Jakarta. He had been purchasing military ware from these countries and sending them across to Sri Lanka. The Indonesian Anti-Terrorist Unit was responsible for the arrest. At the time of Ilanko’s arrest in Colombo, he was staying at a lodge belonging to a Subramanium. Inquiries revealed that Ilanko had kept company with a senior police officer and an opposition politician who shielded him. One of the major setbacks for the LTTE, during Eelam War IV, has been the arrests of several high ranking international operatives involved in fundraising, arms procurement and shipments.